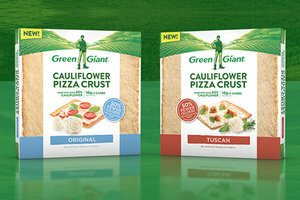 Brought to you by Green Giant. Two Tasty Varieties - With only EIGHT simple ingredients, the Original is classic and ideal for just about any pizza creation you can dream up. The Tuscan is perfectly seasoned and ready for your favorite traditional Italian toppings! 80% Cauliflower; 100% Vegan - With some cauliflower-boosted products, the cruciferous vegetable is barely present (resulting in less-than-impressive nutritional info). 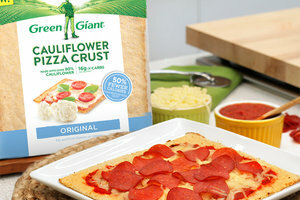 Not so with these mostly veggie pizza crusts! And we LOVE the fact that they meet the needs of those following plant-based diets. Find them at Walmart, Meijer, H-E-B, Publix, ShopRite, Wegmans, Jewel-Osco, and Giant Eagle! Join Lisa TOMORROW for a Facebook Live with Surprise Guests! ⭑ Taste tests & recipe demos! ⭑ Pizza trivia with pizza prizes! ⭑ Two very special guests at Hungryland! A whopping 25 FANS will each win coupons for FOUR FREE PIZZA CRUSTS! Mark your calendar, and BE THERE.